4 How Do I Wax Hair with Elastic Wax? Many people prefer waxing to shaving for hair removal. Waxing lasts longer, and your skin stays smooth for weeks, not days. When new hair grows in, it's usually finer and softer than when it regrows after shaving. If you're ready to take the plunge, you can wax your arms at home with an inexpensive drugstore kit. Make sure your skin is thoroughly dry. The drier your skin, the better the wax adheres. Don't plan on waxing straight out of the shower or bath -- give yourself an hour or two to dry and hold off on applying any body lotion or sunscreen to your arms until after you're done waxing. Rub an oral numbing gel over your arms to reduce the pain. Aesthetician Anna Stankiewicz tells "Marie Claire" magazine to apply the gel about half an hour before you wax. Dust your arms with a light coating of baby powder. Stankiewicz explains that the powder soaks up any excess moisture on your skin, allowing the wax to adhere better. Heat up the wax. Most at-home kits contain a type of wax that heats up when you rub it between your hands. Press the wax onto your arm. Apply the wax in the direction your arm hair grows. For most people, this is an arc that moves from the inside of the arm to the outside. Hold your skin taut and pull the wax off your arm against the direction of hair growth. Try not to lift the wax up high; peel it away as close to your skin as possible. 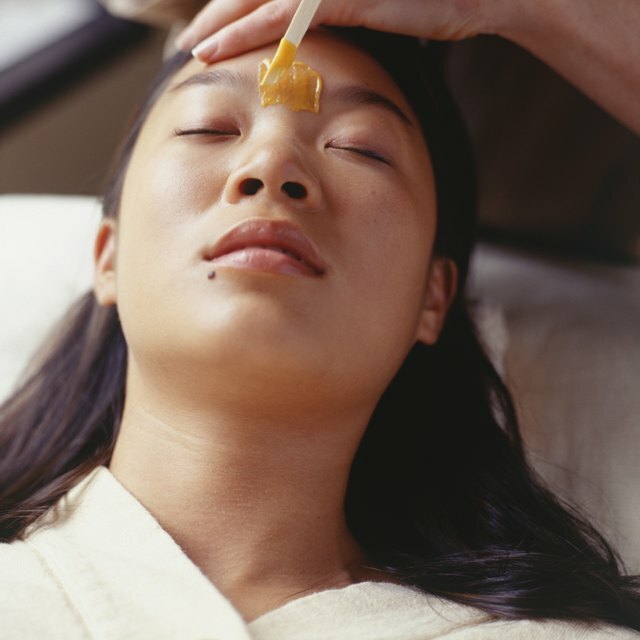 If you don't keep the skin taut, the wax may adhere to folds of skin during removal, causing a pinching sensation. Moisturize with body lotion after waxing to soothe your skin. If you've never waxed before, do a small patch test first to make sure your skin doesn't have an adverse reaction to the wax. Wax one small strip of arm hair and watch it for redness, bumps or other signs of an allergic reaction. If the patch test goes well, wait 24 hours and wax your arms. Wait until you have about a week's worth of hair growth before waxing. The longer the hair, the easier it is for the wax to grip it and remove it. Do not use a liquid toner, exfoliator or other antiseptic solution on your arms prior to waxing. These strip your skin of essential oils, leaving it vulnerable to wax abrasions. Never wax sunburns, rashes or irritated skin.